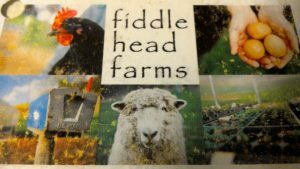 Named after the curled frond of a baby fern, Fiddlehead Farms in Clyde, North Carolina, was founded by John Michael and Stacey Thompson in 2006. Inspired by a friend, the couple made the leap from an organic home garden to an organic market garden in 2010. 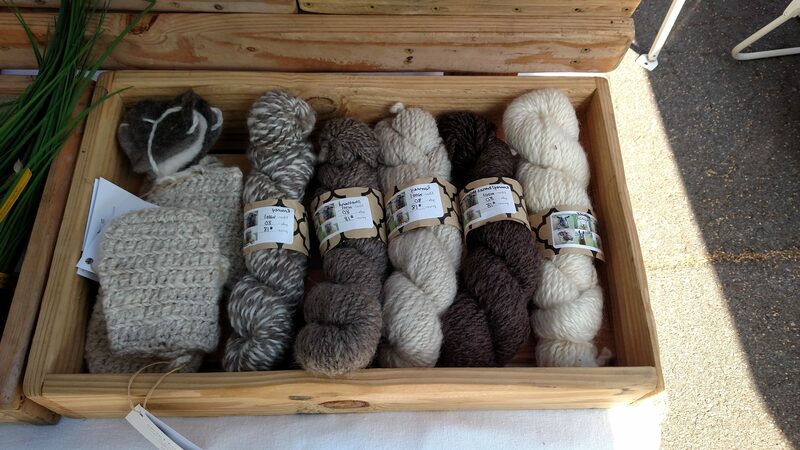 Since that time, they have made available their harvest and wool products through the Haywood’s Historic Farmers Market. John and Stacey met at Clemson while studying animal science and horticulture respectively. The day before he left for the Appalachian Trail, John told Stacey what they both knew. There were fiddleheads along the trail, packages from her at resupply points, and step by step good friends became something more. Three-year-old Hazel is planting flowers this season. The smiling boy with keen eyes is Conrad in his eighteenth month. Watching his son play on the grass in front of Hart Theater, John says, “It’s really not about growing vegetables but about growing the soil.” The farmstead is also home to five sheep, two alpacas, and a guard llama named Secret. At the edge of their booth is a bundle of wool with the picture of a sheep named Jonas, one of the first Shetlands at Fiddlehead Farms. Through the hows and whys in our conversation, Stacey recalls her grandparents’ farm in Iowa where her grandmother taught her how to spin and crochet, treat fabric with natural dyes, and waste not want not. She says, “I learned to mix yellows with indigos to find green.” These days it is about soil that can’t sit still and not enough hours in a day. Even so, the inspiration is always family. John hands thin slices of green apple to Conrad while Hazel eats her sandwich. Before the children awoke, John and Stacey gathered today’s fare to make sure it was fresh for the market. 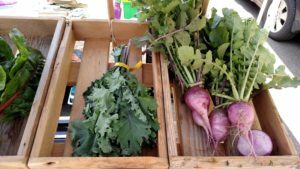 What is out of sight are those hours before dawn picking radishes and additional hours at other jobs for the sake of the farmstead. Also unknown to most is how much John likes Pink Floyd, that Stacey weed-eats the gardens with a flame, and that the lady buying radishes at the booth was Conrad’s midwife. The market day is almost over and people are packing up their wares. Stacey: “What’s great is that if we don’t have what someone is looking for, we feel safe recommending other vendors.” And you wonder about words: the honest kind you tell a friend before you hike the Appalachian Trail; the grandmother ones that teach; the soothe sounds for a child; and the grateful kind to those growing theirs and others soil.